The Spring Mill web site is based on a full-width theme which can either work as a single- or multi-page web site. In this case we’ve used it as a hybrid, with a comprehensive home page along with a series of information pages. The site is, of course, fully responsive, mobile friendly and optimised in line with best SEO practices. The purposes of this site are to promote Spring Mill Business Park, advertise any properties that are available and also to provide links to the businesses on the site. 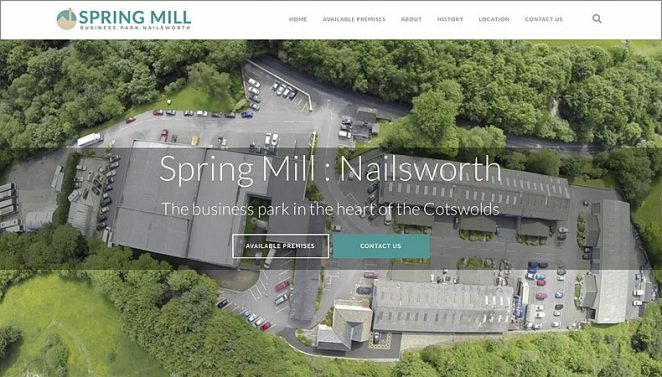 A drone-shot high-resolution video to show potential tenants an overview of the Spring Mill site and the beauty of it’s surroundings in a wooded valley between Nailsworth and Avening.